Burg Eltz is the German castle that has impressed us the most and currently holds the title as our favorite castle in Germany. Even in a region where it is almost impossible to not stumble over some ruined castle, this castle really stands out. Burg Eltz sits in a forested green valley alongside the babbling Elzbach Creek in the Mosel Valley, hidden away from the traffic of the main roads. Walking up (or down) to this magnificent castle provides for a really knockout view, as it looks today much as it did in 1540 when the last major part of the castle was built. Unlike the vast majority of castles along the Mosel and Rhine Rivers, this was one of the few that was not destroyed or badly damaged. Its history is quite fascinating as it has been owned within the same family since at least the 12th century and continues to be privately owned by the Eltz family. Unlike the more popular fairytale Neuschwanstein castle in Bavaria, Burg Eltz was not built as someone’s Romantic ideal of a castle but is a real stone-and-timber medieval castle which served as the home and defensive fortification for three branches of the Eltz family. We’ll tell you how you can visit this wonderfully preserved gem, share a little history, and tell you about our own visit to Burg Eltz. Burg Eltz is located in the Mosel Valley and a fairly easy drive from anywhere along the Mosel River or a potential day trip from the Rhine Valley. You can arrive at Burg Eltz in a variety of ways, and you will likely need to combine options unless you plan to drive. These are very well-explained on the Burg Eltz website, so I’ll just briefly mention your options. Car (or Taxi): Be careful of following signs to Burg Eltz as some don’t lead to the castle’s parking lot. If you are using a map (or a confusing GPS), you can head towards the town of Wierschem and then follow signs as the castle parking lot is just past this little town. Paid parking (and drop-off point for taxis) is located above the castle. From the parking lot, you can either walk downhill on a footpath for about 10 minutes to reach the castle or wait for the castle shuttle bus (about every 10 minutes, 2 euros per person). Public Transit: There is a bus that runs seasonally on weekends and public holidays that you can take from various towns along the Mosel (including Karden and Moselkern) to reach Burg Eltz. Be sure to check the schedule. Boat: Hop a boat along the Mosel River that stops at either Moselkern or Karden and then take a taxi to the castle or continue on foot by hiking. Train: The closest train stops are in Moselkern and Karden (Treis-Karden station). From here you can hike, take a taxi, or take a bus (depending on day). Hiking: Approaching Burg Eltz by foot is highly recommended if you have time and the ability to do so. Even approaching by foot from the car park grants some great views, but for a full experience consider hiking from Moselkern, Karden, Pyrmont Castle, or Wierschem. There are hikes of various lengths and intensities available and the hike starting from Wierschem called the Eltzer Burgpanorama (Eltz Castle Panorama Trail) is considered to be one of the most scenic hikes in Germany. Just make sure you learn about the hike of your choice as some are more difficult than others and require proper footwear and provisions. 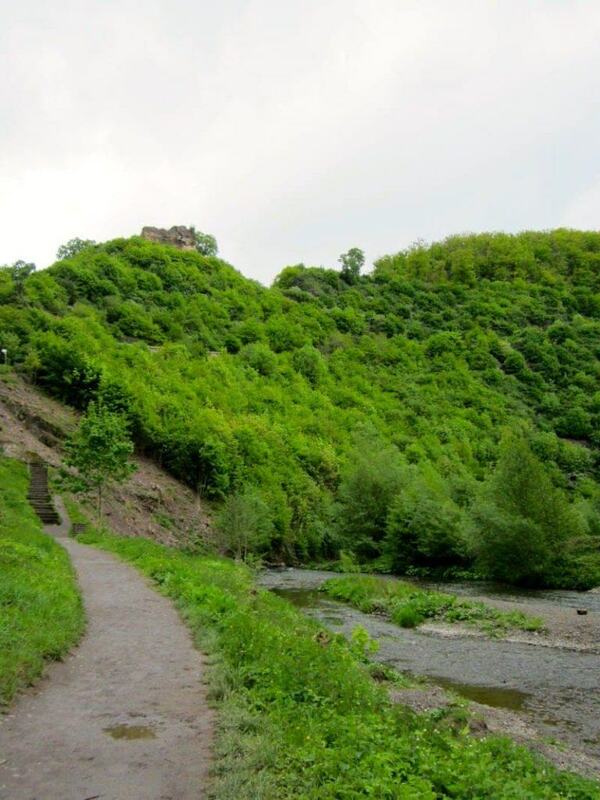 There are a dozen or so great hikes in the Mosel, Eifel, and Rhine areas and you can find out more about both hikes around Burg Eltz and throughout the region on the Traumpfade hiking website. The castle is currently only open to the public from about April to October. When open, the current hours are from 9:00am to 5:30pm (9:00 – 17:30). All visits are guided and guided tours depart every 10 to 15 minutes in German. Guided tours in other languages, including French, Dutch, and English, are also available but depart less frequently. Translations of the tours in various languages are also available. The current cost is 9 euros for adults, with discounts available for students, the disabled, families, and large groups. Credit cards are only accepted on large purchases, so make sure you have enough cash (euros) available for the entrance fees, food, shuttle bus, parking, etc. Burg Eltz has a gift shop and two small eateries which serve meals and snacks which are open daily when the castle is open. Bathrooms are conveniently located outside the castle. During our visit, we couldn’t find any free potable water available so if you need water, you’ll have to bring it or buy it. 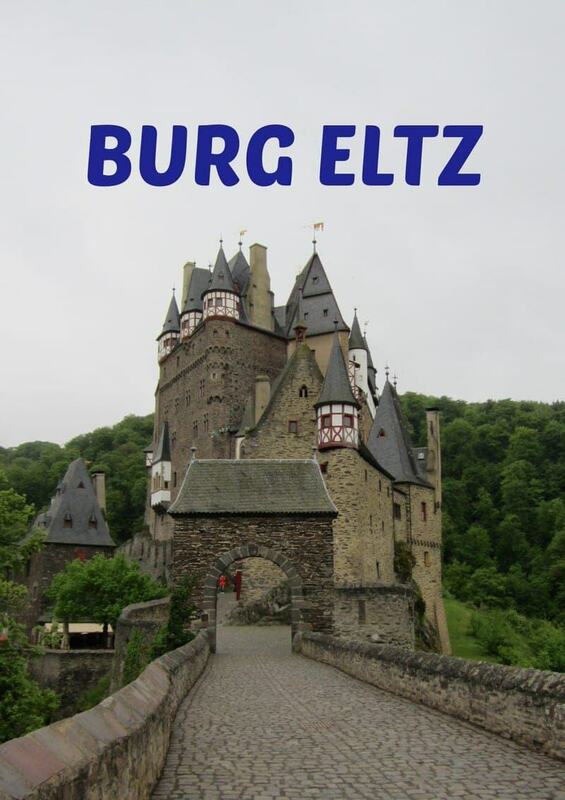 You can find out more information by calling the castle at +49 2672 950500, email them at burg @eltz.de, or visit the very informative official Burg Eltz website. Photography is sadly not currently allowed inside Burg Eltz, but you can explore some of the wonderful interior photographs on the website. After a final walk around the tiny town of Beilstein and a delicious breakfast at our inn, we left Beilstein and drove along the Mosel River towards Moselkern to visit Burg Eltz. We had debated about whether to save time and just park at the castle car park or to spend more time soaking up the scenery by doing a longer hike. We opted on a compromised option where we drove our rental car to Moselkern and parked at Landhotel Ringelsteiner Mühle (94 Elztal, 56254 Moselkern, Germany). The hotel allows non-guests to park there for 3 euros a car (bring euros for the parking machine) and also has a restaurant for those wanting snacks, coffee, or a meal. While you can also begin the hike from the Moselkern town center or train station, this saves about 30 minutes of time each way if you start from the hotel parking lot which is right along the trail. The trailhead to Burg Eltz is right next to the hotel and easy to follow. 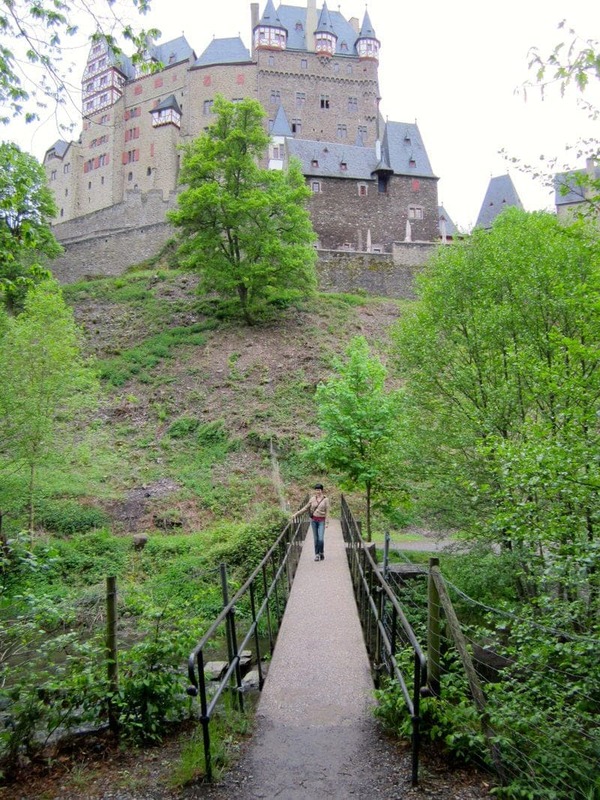 The path meanders near the Eltzbach stream through the pretty Eltz Forest all the way to the castle. 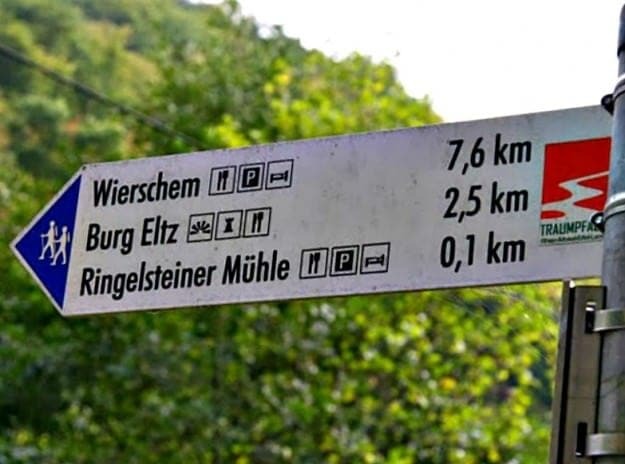 There are a number of hiking trails in the area but signs will continue to point you in the correct direction to Burg Eltz. It is an easy 40-minute hike although there are some steps near the beginning of this hike and at the very end as you’ll have to climb a few flights of steps to reach the castle. 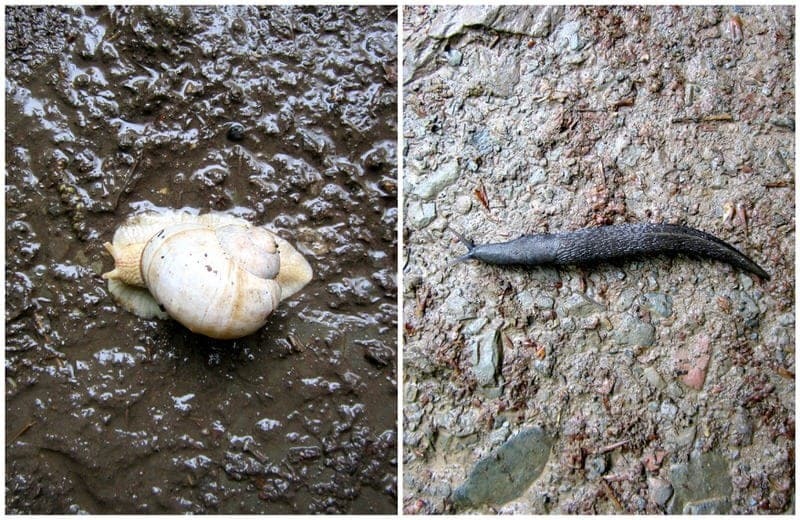 It had been raining a lot during the time of our visit, so the trail was a bit wet and muddy in areas which made it a bit slippery but a great environment for the many slugs and snails we spotted along the way. The approach to the castle is quite magical as it begins to appear at the very end of the hike through the trees. This medieval castle with its eight soaring towers, turrets, and timber frame structure appears like a fantasy tucked within the lush green Eltz Forest valley. It is perched up above the valley floor on a rock spur and surrounded on three sides by the Eltzbach. You approach by crossing the Eltzbach across a stone bridge and then climbing steps up to the castle. It is really a late Gothic dream come true! We purchased our tickets (cash only) and were told that they had just started another English-language tour and that they would start the next one in 30 minutes. Very well worth the wait rather than doing the castle tour in German (we did a castle tour in German once, would not recommend). Visitors can only visit the main part of Burg Eltz’s interior with a guided tour, but the Treasury can be visited without a guide at any time during opening hours and the admission is included in the castle ticket price. The Treasury exhibits are labeled in German but we picked up a free English brochure that includes all the labels in English. The Burg Eltz Treasury exhibits an important private collection of the Eltz family collected over the past eight centuries, containing a lot of gold and silver items, porcelain objects, jewelry, weapons, and other valuables. After our visit to the Burg Eltz Treasury, we went to the inner courtyard, where you can observe the results of over 500 years of building by three branches of the Eltz family. The earliest record of the castle is from 1157. By 1268 after a dispute within the Eltz family, the ownership of Burg Eltz was split between three Eltz brothers and later their descendants. 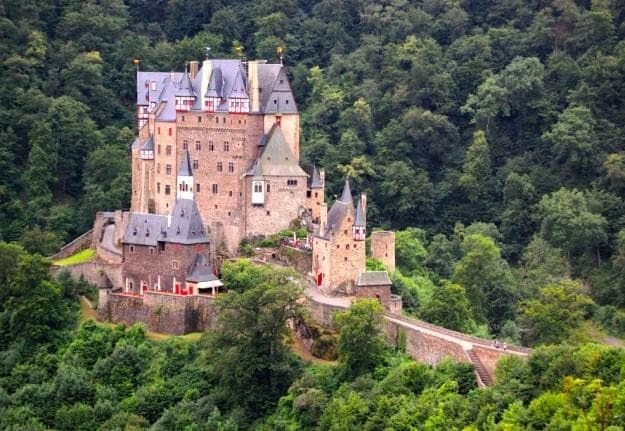 Most noblemen could not actually afford a castle of their own so by polling resources and political influence across the three families they were able to construct, maintain, and protect Burg Eltz across the centuries. At one point, over 100 people lived inside the castle’s almost 100 rooms. The three branches of the Eltz family (Kempenich, Rodendorf and Rübenach branches) owned Burg Eltz until 1815 when it was taken over by the Kempenich branch, and members of this family still own the castle today! Luckily for tourists, Count Karl zu Eltz in the 19th century began restoring his ancestral castle and later heirs would also invest in the restoration and costly upkeep of the castle. While sections of the Rübenach and Rodendorf families’ homes in the castle are open to the public, the caretaker and Kempenich branch of the family uses the other third of the castle. In the courtyard, we met our tour guide for the English tour and joined about 10 other English-speaking visitors for a 45-minute tour of the interior of the castle. The first room you enter is the Armoury, originally the entrance to the Rübenach House, which contains a very impressive collection of canon bolts, weapons, and armor. Sadly, no photographs are allowed of the interior of the castle except in the Treasury (check out photographs on the castle’s website), but the tour is very informative. You only get to see a small percentage of the rooms of the castle, but the tour provides a nice overview and includes the armoury, meeting halls, bedrooms, dressing rooms, living areas, a study, and one of the kitchens. The Knight’s Hall is an interesting room as this is where members of the three branches of the family living in the castle would meet to work out problems and have joint celebrations. A carved jester’s mask symbolizes freedom of speech on the wall and a large rose above the door stands for the “rose of silence” that things discussed should not leave the room. The 15th century kitchen at the end of the tour gives you a good insight into medieval food storage and cooking. Almost all the furnishings we saw inside the castle during the tour are authentic and date back over the past eight centuries. 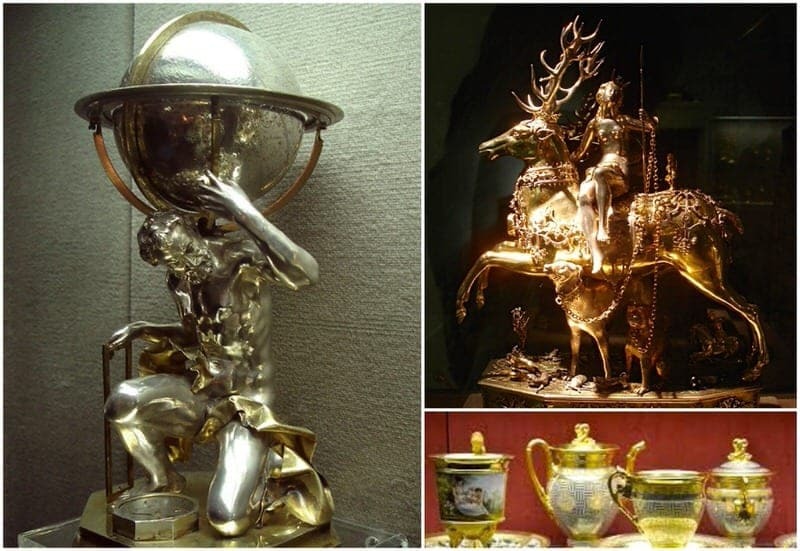 These include priceless murals, paintings, furniture, weapons, suits of armor, hunting trophies, and personal effects, The most famous painting is Lucas Cranach The Elder’s “Madonna with Child and Grapes”. One of the most special things about a visit here is all these items have been at Burg Eltz for centuries and were all personal possessions of the Eltz family. We really enjoyed the guided tour here and were just a bit disappointed about the no-photo rule (this is common in German palaces and castles) as my photos help me better remember what I learned from a visit. After our tour, we paid a quick visit to the castle gift shop and headed back down the same trail to retrieve our rental car from Landhotel Ringelsteiner Mühle. We then drove from the Mosel Valley to seek out new adventures in the Rhine River Valley. Along the way we passed a couple of castles, including the 13th century Burg Thurant castle which sits above the town of Alken overlooking a pretty vineyard. This castle can also be toured, but we didn’t want to stop as we were headed to another castle, Burg Stahleck, that would serve as our lodging for the night. 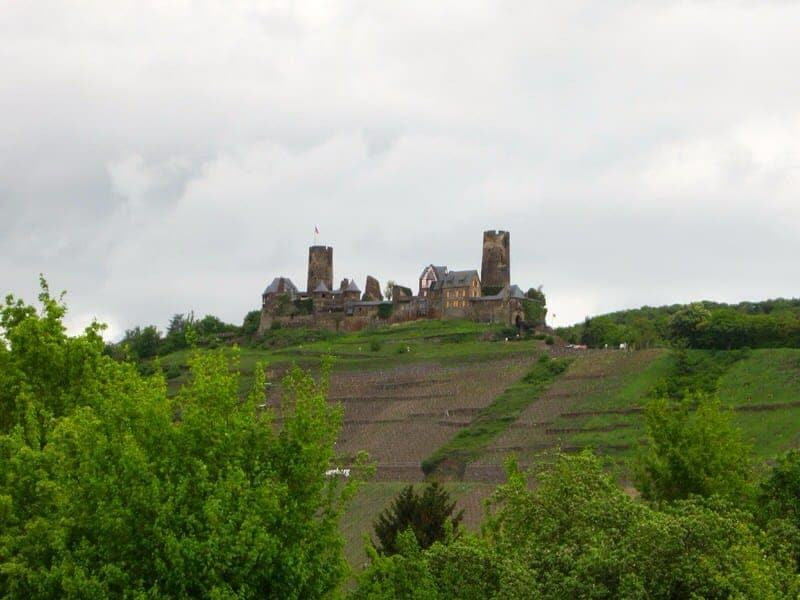 Burg Stahleck is a 12th-century castle that has been converted into a hostel in the picturesque Rhine town of Bacharach. A castle at hostel prices, count us in! We loved our visit to Burg Eltz and highly recommend approaching the castle by foot if possible for the full visual effect of this impressive medieval gem! We chose a shorter hike which we really enjoyed, but if we returned we’d probably choose one of the longer hikes, such as the Eltzer Burgpanorama hike from Wierschem. Burg Eltz is a must-see if you are in the Mosel River Valley and a recommended day trip from the Rhine River Valley if you enjoy castle tours. It’s hard to beat a medieval castle set in a pretty forest filled with the treasures and furnishings collected and cared for by a family over the past 850 years! Have you visited Burg Eltz or any other German castles? Tell us your favorite German castle. Have any questions about our visit to Burg Eltz or trip to Germany? As always, we love to hear from you! Hi there! We are planning to go to Germany in April with our son and grandson. After seeing your recommendation, we are planning to see this castle. Can you recommend a place to stay near this? Thank you! It depends a little if you are traveling by car, train, or bus and where you are coming from/to, but our two favorite places to stay near Burg Eltz are pretty Beilstein (35 minutes from Eltz Castle) and Cochem (30 minutes from castle), and you can see our guides to Beilstein and Cochem for lodging recommendations (see end of article). Beilstein is a small but scenic village and Cochem is also scenic but larger and has better transport connections (train and bus). Let us know more if you want specific hotel recs in one of these towns. Other option would be to stay in Moselkern (very close, you can even walk to castle from here) or Koblenz (30 minutes away, larger city where Mosel and Rhine meet) but both have less charm than the others but are both closer to the Rhine if you are looking for something closer to the Rhine River. If you are driving further that day, the kids might enjoy a stay at the Burg Stahleck, which is a castle that has been turned into a hostel. Offers dorm style and private rooms to visitors of all ages. 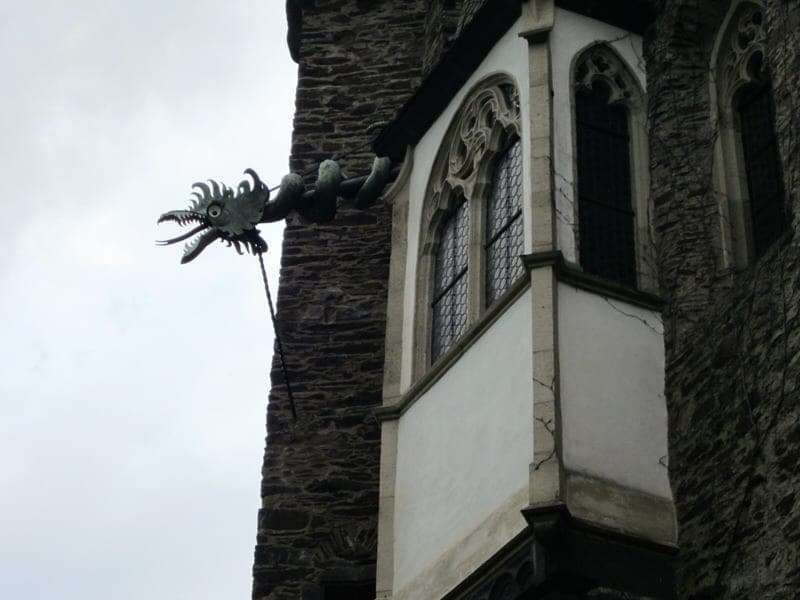 son has project on the Eltz Castle and we are having trouble finding more information on this castle… can you help? What material was used to build the castle? Just stone? State the people who were living in the region during the time it was built? who built the castle? Why was it built? When was it built…. a precise date if possible? 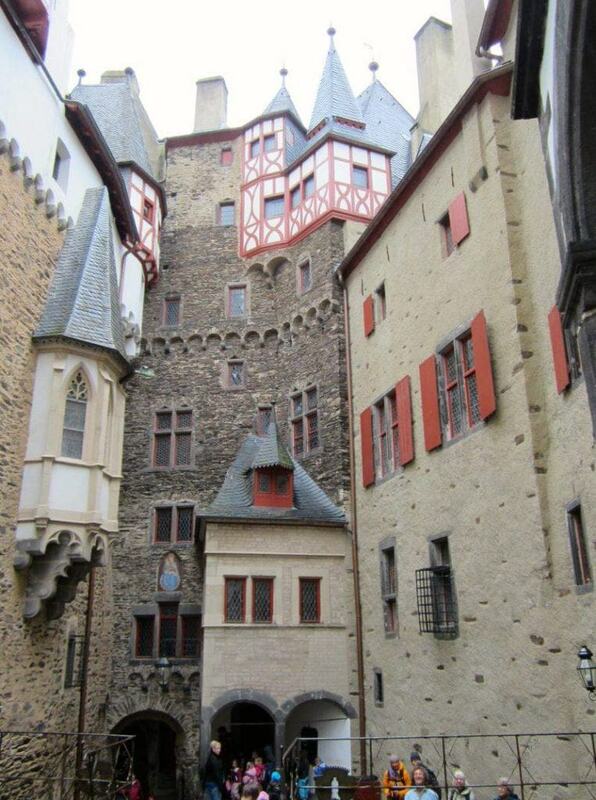 My great-grandmother lived at the Burg Eltz until she married in 1879, her sister then took over her position of head housekeeper (the holder of the key), and she lived there in the Kempenich house until she died. There was a tremendous fire in 1920 and the burned sections were restored. What they call the treasury is actually a ‘treasure’ room. My cousin said it was a ‘poor’ translation. The family joke is that my cousin spent her summers there with the Eltzer Lischen (Lizzie of the Eltz)… laughing… she told me that this room was the ‘closet’! In the spring, they washed all the woolen clothing and blankets and took them down there…pulling out the summer things. In the fall, before returning home, she would help reverse the procedure. Also, before the Euro, the Burg Eltz was on the back of the 500 Deutsche Mark note. This came as a complete surprise for us, a large group of cousins took us out for lunch, and then they said “Come, we go to the castle!” Speechless would be an understatement! 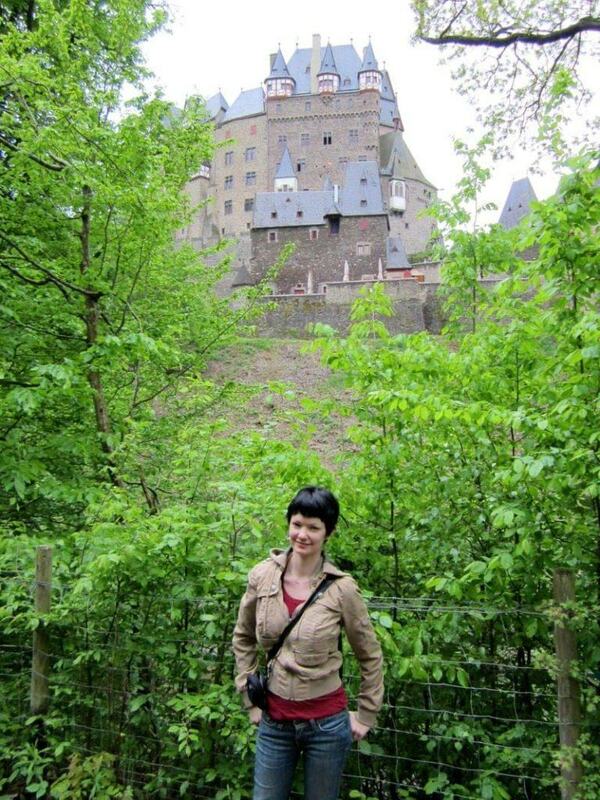 I will go to the Burg Eltz in the beginning of april. We’ll arrive in Moselkern by train and then hike to the castle. I have a question. From which point do you shoot the last picture (panorama from an high point)? Is it far from the castle? Great place! What is the best season to go there? Is there any festival that shoudn’t miss? Hi Ho, really any time can be beautiful here. 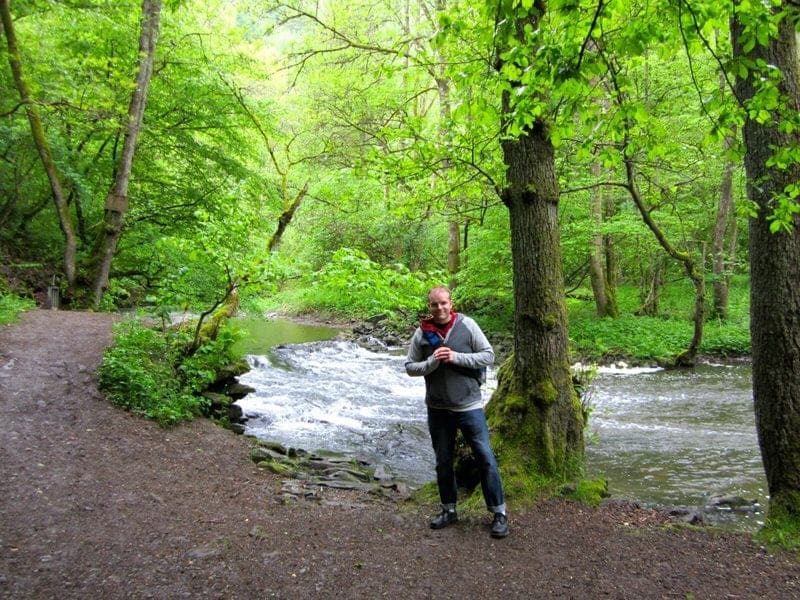 I think my preference would be to go during Spring (or early summer) as we did if you plan to do any hiking so you get the best views of the lush green forest. I am not aware of any must-see festivals nearby but as mentioned you will want to make sure you plan your visit while the castle is open, as it is only open to the public from about April to October. Wow! It’s like a fairytale! So beautiful! It is really is a spectacular castle! Gorgeous!!! I missed that one when I was there…way back in the day (2002)…now you two are making me salivate …so wanting to go back. MUST SEE!! <3!! Yes, being a travel blogger is great because we can relive our travel experiences through the posts, but it also makes us really miss all the wonderful places we visited such as Burg Eltz! If you head back to this part of Germany, I would definitely put this one on your list. How beautiful! The picture you took shows how magical the castle looks when you’re walking up on it. Love it! Thanks Carla, it really can be a magical place! This is great. I have only really heard of Neuschwanstein castle so it’s great to see another castle. I would love to visit and I think hiking there would add to the experience! Yes, Neuschwanstein is definitely the most famous and visited castle in Germany but there are dozens of great castles in Germany. This is our favorite so far:) If you visit, I’d definitely try to approach by hiking if you have the chance, the forest itself is lovely and nice way to approach the castle from afar. Hi Emily, thanks for stopping by. Bavaria has some of the most famous castles in Germany but Burg Eltz is actually in the Mosel region of Germany which is northwest of Bavaria. If you are thinking about visiting the Rhine River area, you’ll be near here. That castle looks amazing! I love that it’s deep in the forest, it makes it more magical that way. Thanks for sharing!! I know! The history of this castle belonging to the same family for over eight centuries is pretty astonishing, especially in a country where so many great buildings were destroyed or confiscated during the many wars. I can see why this might be your favorite! It’s gorgeous. I haven’t been to many castles but so far my favorite has been Haut Koenigsburg in East France. Hi Shannon, thanks for stopping by! We have been visited Haut-Koenigsbourg in the Alsace region of France too, and enjoyed that visit as well. That is an interesting castle with a tangled history of German and French ownership much like the region itself! I’ve been there – loved it! It is the type of place I always imagined when I read fairy tales as a kid. Love looking at your pictures – brings back great memories! We had the same thoughts when reading this as it was making us remember our hike and castle visit! Would love to return to the Mosel and Rhine Valley areas in Germany. Wow! I don’t think I’ve even heard of this one, but it’s gorgeous, especially that last picture where you can see all of it! The fact that it’s in the middle of a forest makes it look like straight out of a fairy tale! It is really does have a great setting and a very interesting history. Germany has so many fairytale places tucked away here and there! And another treasure of my own country that I haven’t visited yet! Germany has soooo many castles and they’re all pretty amazing! But I agree, Burg Eltz is absolutely stunning! Really need to visit it one day! Van, you have to go visit once you are back in Germany. The history and setting really makes this one a bit special I think, although Germany is filled with many great castles and palaces! After seeing your german castles I can’t wait to go to some! They are truly fairy tale castles. There are many great castles in Germany. If you head to Bavaria, consider the Bavarian Castle Pass as it saved us quite a bit of money when exploring castles and palaces in that region.